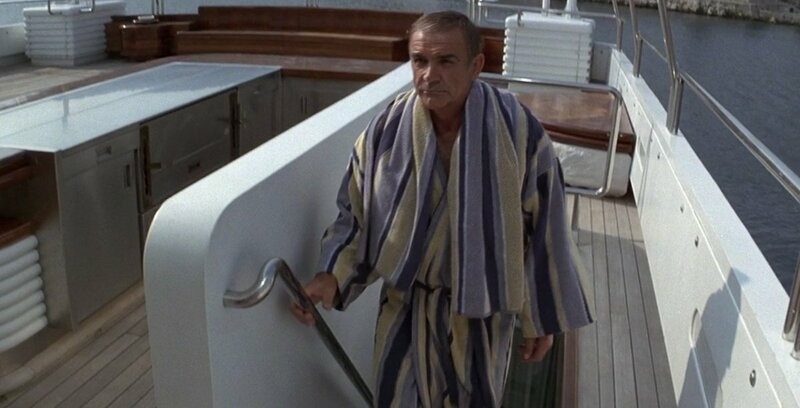 Bond shows up on the Flying Saucer, in a wetsuit, but he’s expected, but his ‘hosts’ are nice enough to give him a bathrobe. Bond seems to wear these almost as much as he does tuxedos, going back to Dr.No, it seems. This scene is largely similar to the scene in Thunderball where Bond is invited to Largo’s estate, except in this case it’s much later in the film. Except of course Bond is allowed to leave in this case, whereas the Flying Saucer has already set sail to Palmyra (which is the name of Largo’s estate in Nassau in Thunderball, but here is located somewhere in North Africa). …of course he also gives Bond a look at his situation room, which of course gives Bond an idea. He meets with Domino in the gym (with that awful music playing), aware that Largo’s probably in his observation room behind the mirror (as we saw earlier in the film). He kisses her, to get a ‘reaction’ so Largo will freak out, and Domino also pushes the fire alarm so that the situation room will be evacuated, allowing Bond to send a distress call to M. He also gets amused by Largo’s nuttiness as he takes a fire axe to the piano and stereo, and apparently the music in the gym is so loud he can’t even hear the fire alarm until he smashes the stereo! He doesn’t do anything until they arrive at Palmyra, which is much larger and ornate than Thunderball’s oceanside estate, where he quickly orders Bond to be taken away. We then get a very, very tense scene where Largo creeps around her and messes around with a green statue (Her “Wedding present”). And one nasty forced kiss too. He also delivers a monologue to Bond a bit later, revealing the location of one of the nukes (Washington) and leaving him chained up. Thankfully he forgot to confiscate Bond’s watch…which of course has a laser. Domino is put up to be sold as a wife to local bidders (Her “wedding”) and we hear that music again, but Bond quickly saves the day on a horse, leading to an awkward close-up of Connery as he shouts “HOLLLD ONNNNN!” as they jump into the sea. Including the horse. Although part of this is accomplished via some sort of crappy green screen effects, the last shot seems to show a real horse falling sideways into the water. This actually caused some controversy, and it’s said that the “No animals were harmed” disclaimer is a result of this scene….although other sources seem to indicate that it’s been in place since 1939’s “Jesse James”. Palmyra gets shot up by the navy, but the saucer’s already on it’s way out. Tracking them in a nearby sub, Bond figures out that the pendant Domino has is where the second nuke is being placed-right near some oil fields in an ancient underground temple. 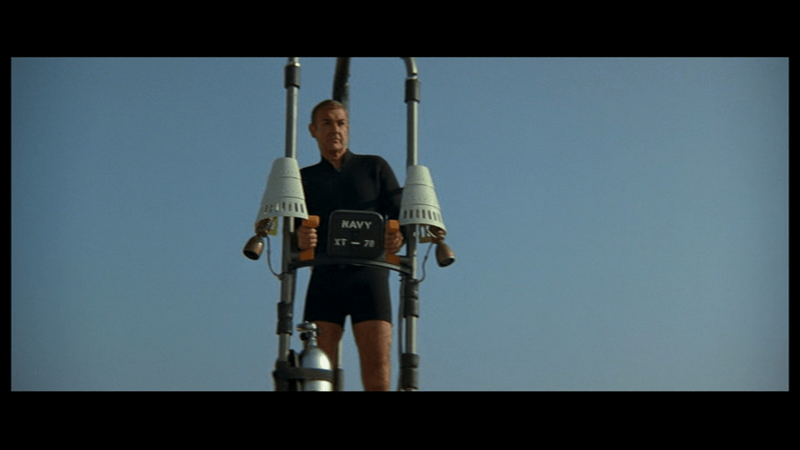 Cue Bond using the jetpack, although one nowhere near as cool as the original Thunderball version IMO. Sure, the helmet’s a bit corny, but there’s just something in the less complicated design, and the fact that Bond’s wearing a suit while using it that says “Bond” more to me than whatever tactical suit he’s wearing here. Sure, Bond often wears several more tactical clothes in the films many times, but if they were trying to re-create the jetpack here, it could’ve been done better. After telling a delighted Blofeld (The last shot of him we’ll see in the movie, talking once again to the skull camera), the big end battle begins in the ground temple. Although maybe it might seem a bit more fast-paced than the big underwater battle that ended Thunderball, it just seems to lack tension and excitement…and this is from the same director who did some of the most tense battles ever in film. In all the confusion-which does include a kind of cool stunt of Bond knocking the head off a statue-Largo manages to escape with the nuke, much like he did in the original, except this time he’s underwater. The result is pretty much the same. Death by Domino’s harpoon. Although I think the original is far better in this regard. Domino is wearing a tiger swimsuit, which was the focus of a lot of the film’s marketing, of course, much like her predecessor’s look in the original. But Bond state’s “never again”, recalling the title of the film…but then gives a wink to the audience, while being encircled by the pseudo gunbarrel “007”…hinting this Bond might come back. Technically, he would return in another remake of one of his old classics, but this time the video game version of “From Russia With Love”. I’ve heard the game’s actually pretty good, but from Connery’s voice in the game it sounds very different-his scottish accent, in particular, is much more present. There were also rumors about Connery returning to film another Thunderball remake, although this time as the villain(!) against Timothy Dalton-Warhead 2000, which I brought up quite a while back. 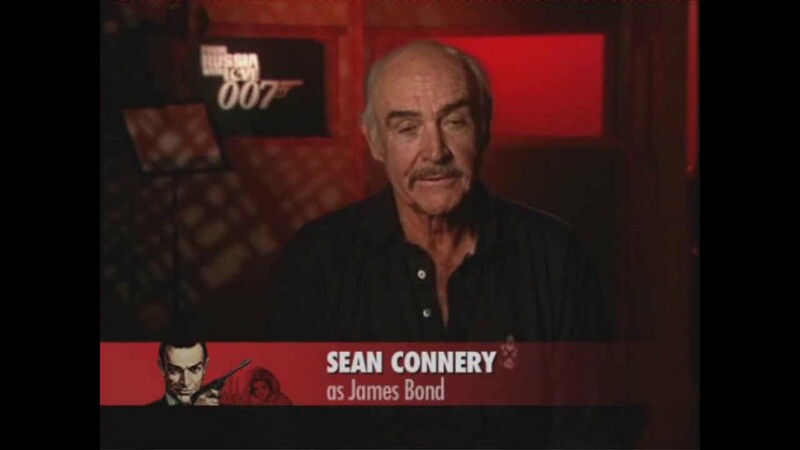 Connery of course has been retired from acting for over a decade, and is well into his 80’s, so beyond this I doubt we’ll see him in any Bond film down the line. (He also has had some mixed feelings about the character, especially given the typecasting in the 60’s). As for the film, it’s an unusual beast. I prefer the original Thunderball, but there are certain aspects that are a bit better, such as the villains. Largo in the original was pretty much just a tough guy, whereas the new Largo feels much more dangerous and psychotic. Ditto with Fatima (Can’t really say much for Sydow’s Blofeld, though, he’s not given much to do) Connery also gives a much better performance here-and looks better-than in his official sendoff, “Diamonds Are Forever” (It also feels far less campy and dated, despite the video game aspects and the wackiness of Barbera Carerra’s Fatima). Some of the changes here-such as the gadgets, the idea of Bond losing his edge and considering retirement, and the MI6 staff changes-also foreshadow future developments in the series. The action scenes seem a bit uninspired though, the settings somewhat more bland at times (with some exceptions such as the Casino and Palmyra), and of course this lacks some of the series trademarks-the gunbarrel, the opening credits, the theme music-which help make Bond, Bond. Sure, the Craig films played around with this a bit, but they still largely kept the theme music and opening credits. So the film’s sort of an oddball, but overall, worth a look. This entry was posted in Film reviews, James Bond in review, Uncategorized. Bookmark the permalink.